Fry the little dragon kid got into trouble again. He was told several times to not go outside the mountanious area because he would draw too much attention, but he never listens. Now look at him. A circus captured him and they are planning to bring him with them on their tours. Maybe this will teach him a good lesson. As his parent, you have to come up with a recue plan. 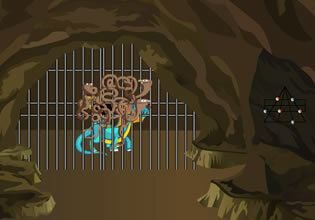 Be careful not to get caught.This is the right moment to seize the cave-prison. Be swift light the wind. Good luck and don't forget to draw the conclusion of this situation with Fry. He will remember this for a while.